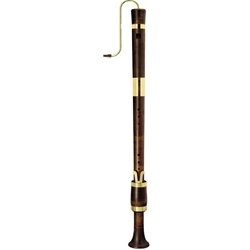 The Moeck Renaissance recorders were completely redesigned in 1997, after a set in the Hofburgmuseum in Vienna. Made of sycamore with a rustic linseed oil stain, they feature a narrow curved windway, which gives more resistance, and are ideal for consort playing. They have a range of one octave and a sixth. PLEASE NOTE: The sopranino, soprano, F alto, keyless tenor, keyed tenor, and bassett are available with standard Baroque fingerings; the sopranino, soprano, F alto, G alto, keyless tenor, bassett, great bass, and contrabass are available with historical Renaissance fingerings. Please contact us regarding the availability of these instruments.